Using the Korean martial art of hapkido as an example, this post examines some of the underlying aspects and themes that can often go unnoticed in martial arts – especially when they are transmitted between differing cultures and contexts. For the past year, I’ve been practicing hapkido, which is a Korean eclectic martial art. I train at a club at my university, which has a parent club in Sydney where I also occasionally train. I’m not a violent person by nature, but I originally began because I wanted to learn some self-defense. Over time, I noticed philosophical and religious influences in hapkido, and martial arts in general, which I think most people are unaware of. I don’t think it’s helped that martial arts has at times been portrayed in the West as something that is exotic, and with such tropes as dragons and stylized yin-yang symbols. But how often are the more serious religious and philosophical underpinnings recognized in the West? 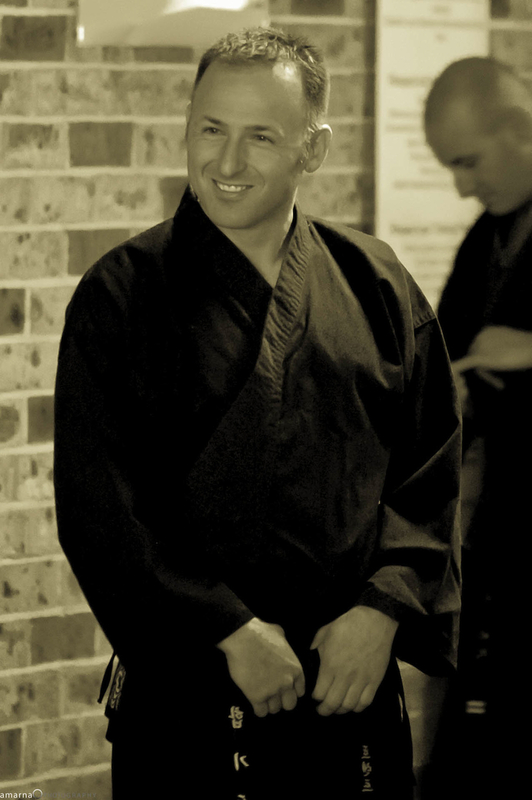 Master Trent Madsen is the chief instructor at the parent club in Sydney that I attend. He has a fourth dan (degree) black belt in hapkido and over twenty years of experience. He also has a black belt in taekwondo and a blue belt in Brazilian jiu-jitsu. During an interview I conducted with him, he spoke about the representation of martial arts in the West, which often glosses over the religiosity characterizing its roots. Specifically, he stated that its representation can be considered an instance of cross-cultural transmission and mutual respect – where traditional forms of practice are appropriated outside of original contexts, creating a cyclical structure of influence that comes to characterize future renditions and forms. According to Master Trent, examples of mutual cross-cultural transmission can easily be discerned in cinema. For example, Japanese filmmaker Akira Kurosawa’s Seven Samurai (1954) was partly influenced by early westerns, and the film, in turn, was remade as a more traditional western (in the West) by John Sturges in 1960 as The Magnificent Seven. If you read about what parts of the patch mean, you will see that this largely Wisconsin-based karate school incorporates ideas of Christian chivalry. Amid the cross-cultural transmission and hybridization throughout martial arts in the West, some of the foundational elements can get lost along the way. A martial art like hapkido has undeniable philosophical and religious influences that commonly go unnoticed. The very name hapkido denotes Taoist influences: hap (합) means “coordinated,” or “joining”; ki (기) means “internal energy,” or “spirit”; and do (도) means “art,” or “way.” Hapkido, therefore, means something like, “the art of coordinated power.” The Taoist influence is, therefore, seen in the concern to work with ki, or the energy that exists within us. Religious influences are also found among the founders of hapkido. Hapkido emerged in its modern form some time around 1958 in South Korea. Choi Yang-Sul is the central figure around which numerous stories of hapkido’s modern creation surround. As a child, Choi was abducted from his native Korea, then under Japanese occupation, and taken to Japan. Choi found himself in a Buddhist monastery in Kyoto where a monk asked him what he wanted to do with his life. Choi pointed to a mural on the wall, which depicted martial arts, and the monk introduced him to Takeda Sokaku, the head of daito ryu aiki-jujutsu. In terms of physical technique, hapkido is a combination of daito ryu aiki-jujutsu and traditional Korean kicking. Religion is not just in the backdrop, however, as hapkido retains these initial elements and influences. Master Trent understands and corroborates the practical and personal religious nature of hapkido from his many years of experience. He also believes that practicing martial arts has affinities with certain religious practices in the West since both instill a moral code, or certain behaviors. Master Trent told me a story of how an Anglican pastor once thanked him for his “pastoral care” in regard to teaching and training his two sons. He was taken aback by the term because it was unexpected. It wasn’t until that moment that he realized what he was doing as a martial arts instructor had ethical or behavioral similarities to what a Christian pastor might do. On this point, Master Trent went on to say: “In a martial arts school there is that weekly contact. If one of the people in this environment has a fight, they have to confess that to me and tell me about that behavior. I don’t give out Hail Marys, but I give out push-ups on a regular basis. And there’s that item of respect that’s always there with the instructor.” And people do tell Master Trent things from their lives. Master Trent knows bits and pieces from the lives of his students, from what they had for breakfast to the bullying that children face in school and how they reacted. According to Master Trent, even for beginners martial arts is about “being the best white belt that you can be.” It’s a moral code that regulates behavior. Master Trent isn’t the only contemporary hapkido master to recognize and stress the religious, or at least moral, nature of martial arts. Marc Tedeschi, in his comprehensive book Hapkido: Traditions, Philosophy, Technique, published a number of interviews with leading hapkidoists, such as Grandmaster Han Bang-Soo, who testify to this importance over mere technique: “If you only learn technique, I don’t call that a martial art. That’s just a skill.” Training in martial arts also requires the individual to have moral conduct outside of training; as Lee Joo-Bang, a Hwa Rang Do practitioner, candidly indicates: “We cannot teach immoral people.” In its truest form, martial arts is an approach to life: training simply cannot be compartmentalized. Many individuals might not realize that martial arts contain religious and philosophical dimensions that have been shaped by cross-cultural transmissions. Such transmissions have led some Westerners to over-emphasize certain aspects of martial arts, and even to cases of clear hybridization. As the cultural transmissions become mutual, they can feed back to the “original” culture or home (as in the Kurosawa example above). And Master Trent is certainly aware of the cyclic longevity that ensues as a result. As he always says, hapkido will never die because it is continually undergoing cultural transmission and development. But whether or not practitioners are aware of these changes, and what implications they might hold, is a different matter altogether. Photograph of Master Trent Madsen by Daniel Saad of Amarna Photography 2013. Image of yin-yang patch courtesy of the Yin Yang Do Karate Association. All rights reserved. Josip is currently working on a PhD in History at the University of Wollongong. His doctoral work revolves around the study of changes in Australian attitudes toward religion in the twentieth century through an analysis of burial practices and Sabbatarianism.